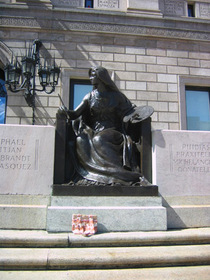 My much-anticipated trip to Fenway Park for Red Sox Opening Day 2008 was this week, and I wanted to bring a gift for my friend to thank her for hosting me for the night (especially since she brought me a beautiful illustrated hardcover Life of Pi - one of my all-time favorites - when I hosted her in New York!). 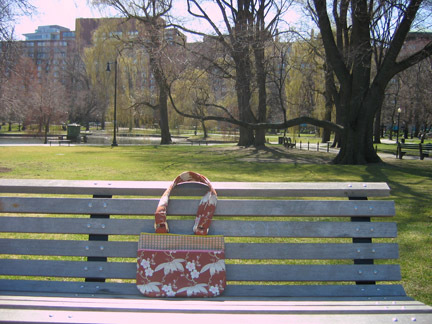 It so happens that when she was here to visit me, she had a bag with her that she'd bought on etsy whose straps were starting to fray. 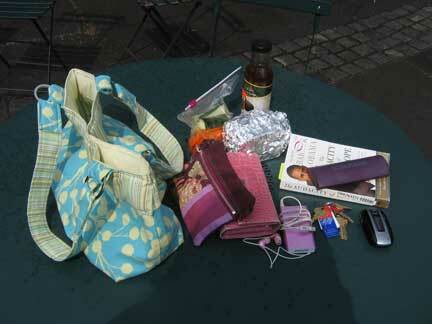 My friend (like myself) carries a lot of stuff (read: books), so she needs a nice strong bag. 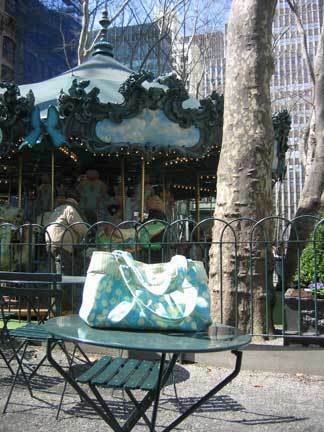 When I saw this one on u-handbag, I thought it would be perfect! 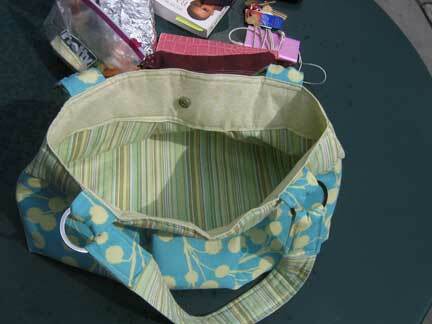 This bag was actually not that hard to make, though it was a lot of cutting out of pieces, because of all the interlining required to make it extra strong. I might actually have made it too strong - the tutorial says to use "firm" interfacing and "heavy" interlining, but I'm still experimenting with interfacings so the ones I bought were really very firm and heavy indeed. 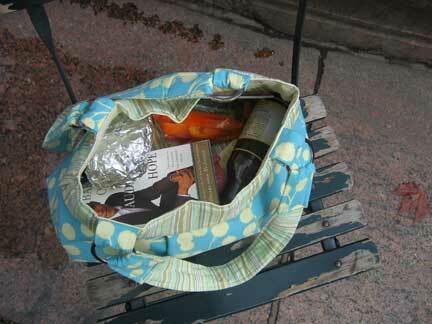 The fusible stuff made my nice cotton fabric strong like canvas - that bag is practically bulletproof! :) I was afraid I wouldn't be able to turn it at the end, but it all worked out, despite the fact that sewing together all those layers I somehow lost half an inch on my outer bag. 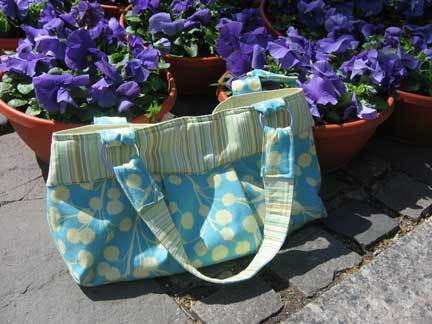 I had to sew the bag interior twice because the first time I used a 3/8 inch seam allowance and tried to place it into my bag exterior to make sure it fit, and the bag interior was way bigger than the bag exterior. (Of course you realize, by this time it was 10pm the night before I had to leave, and I hadn't packed yet, and had to get up at 4am to make my bus.) 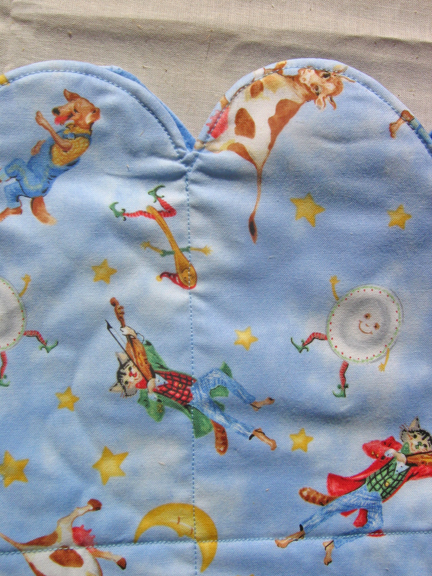 Then it seemed like I'd made it too small, so there was some panic and despair, but somehow when I sewed it, everything came together just right. Whew! This was also my first experience with piping, and I think it came out pretty nicely. It's hard to sew directly on the bias tape, my sewing lines were all crooked and wonky, but that part is just basting that gets covered up anyway. What seems like the tricky part - actually sewing the bag layers together with the piping sandwiched in between - was not as difficult as I feared. It's not 100% even but pretty good for the first time. 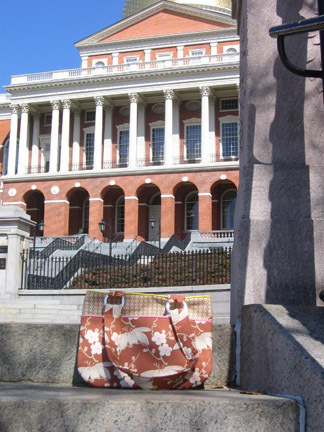 (We took a wee detour to Beacon Hill before continuing down into the park). No swan boats yet at this time of year, but they were filling the pond. 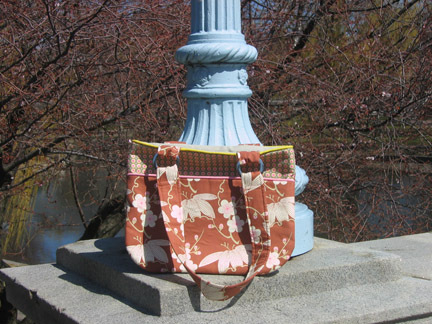 My bags apparently have the power to bring Spring - the last time I made a bag, on its first day in the world they put all the flowers out in Bryant Park, and on this bag's first day they filled the pond in the Boston Public Garden! 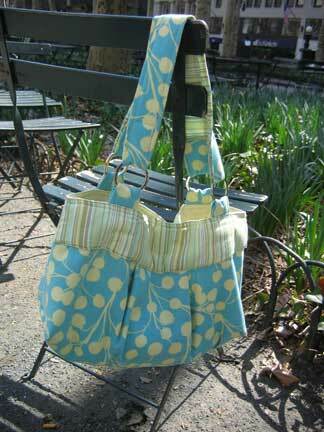 I also broke my first needle sewing this bag. Is that some kind of sewing rite of passage? It felt like one! 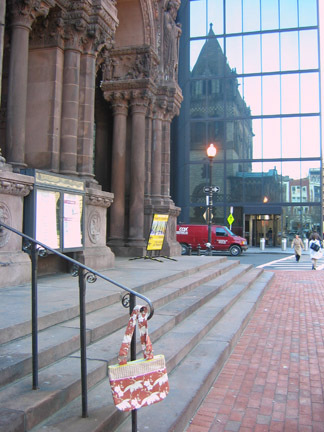 Almost there, here's Trinity Church and the new John Hancock Tower! 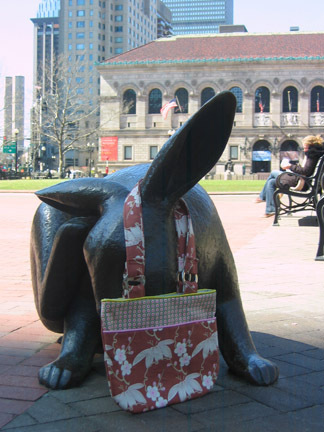 That's the bag's new home in the background. We made it! Just in time for me to give my friend her new bag (she loves it! 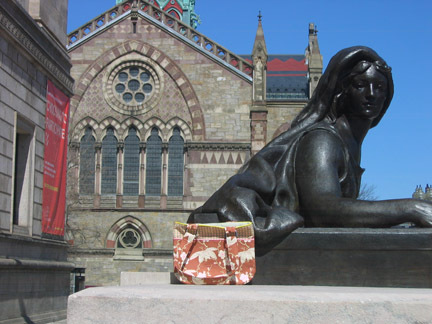 ), drop off my stuff, and head down to Fenway for the Opening Day ceremonies. I won't torment all you non-baseball fans with the details, but suffice it to say that it was a glorious day, sheer joy. And so you can experience a little of that joy for yourselves, I'll leave you with this moment. 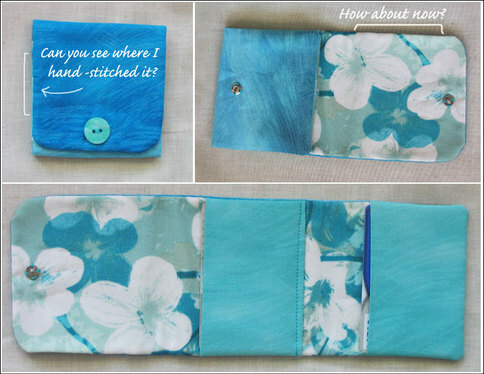 My Wristlet, with link to tutorial - and giveaway! A few weeks ago, you may remember, I spent an entire weekend making zipper pouches and trying different ways to put in zippers. 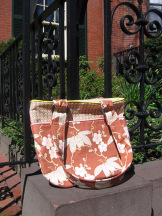 This tutorial from Javajem has yet another way to put in a zipper, similar to Method 2 from my previous post (no handsewing). But this is much easier because the zipper is on the side, not the top, which negates the problem with rounded corners at the zipper ends. 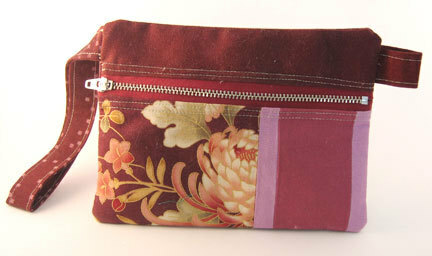 Not only that, this one is definitely the prettiest and most useful zipper pouch I've made so far! 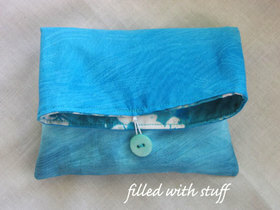 Just goes to show that if you have a good tutorial and cute fabric (and a seam ripper), you can't go too wrong! I was particularly proud of the way I patchworked together the front, which is the first time I've tried something like that, and I think it looks nice. Of course, I meant to only have three strips of fabric - the floral, the lavender, and then the raspberryish - but I calculated wrong and needed another lavender strip to make up the width. But I think it's actually better this way. This project does leave raw edges on the inside of the bag, but the way the bag is you can't really see them, so I don't think it matters too much. I'm not sure if there's a way to get around that. I did also shorten the strap by maybe 3-4 inches from the instructions, because I thought it would be more comfortable for me. And note that I bravely forewent my traditional purple for the lining, and opted for a light, muted green to pick up the leaves on my print. 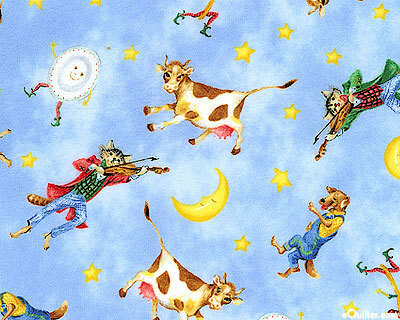 I guess there is one advantage to leaving your leftover fabric lying around in a pile, instead of putting it away, because otherwise I don't think I would have thought of that. This is actually a milestone post - my fiftieth! Wow! 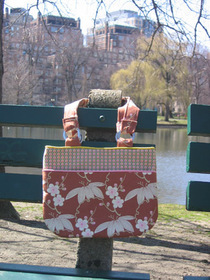 So to celebrate my accomplishment, I will make and give away a wristlet similar to this to one of my lucky readers. All you have to do is leave a comment below that you think will be helpful to other new sewers - a sewing tip, a tool you've found indispensable, your Mom's words of wisdom, or just some encouragement. I'll pick the winner at random. Regarding the time frame, I might point out that I am notoriously slow at everything I do - I think it's because I'm on the contemplative side (some people might call it "spacey"). I alos think that as I gain confidence with my cutting, I'll be able to cut my fabrics all at once - outside, lining, and interfacing - and that will save a lot of time. For interfacing, I used some of my flannel (I bought massive amounts of it on sale a while back, because Amy Karol uses it in all the Bend-the-Rules Sewing projects), but I added a layer of sew-in interfacing that I found in a local Manhattan store, which said it was for medium weight fabrics. 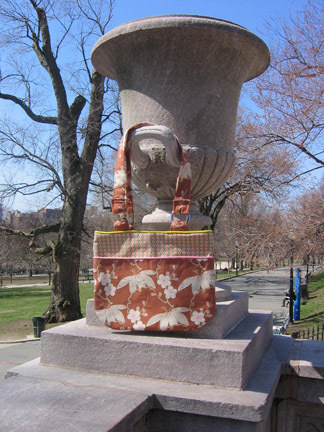 I'm glad I did, because as you can see, the bag is still pretty soft and saggy - though I think that is its nature in any case. In the pix above it has all the stuff I normally lug around - makeup, giant wallet, glasses case, phone, ipod, etc - and you can see that it bulges out all over the place. The handle, on the other hand, just uses some stuff they had on a roll next to the interfacing, that looks like the cotton gauze they use for bandages, except it's stiff. To be honest, I don't think this is what it's for, and I wasn't even going to use it, except it turned out to be the exact width I needed and I was too lazy to cut out a strip of flannel. It seems plenty strong but they handle feels thin and it's already crinkled where it goes over my shoulder (though I can iron it out easily enough). On the bright side, I used my walking foot (cuz like I said, I'm never taking it off) and there was NO shifting whatsoever as I sewed down the entire 29" sides of the handle. It was like a miracle! My other minor complaints with my sewing are that I sewed the handle ends all the way down, so they don't flip out in the cute way they do in the tutorial. 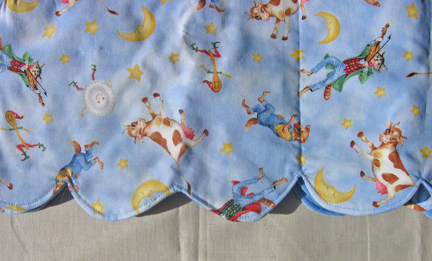 And my lining is a bit too big so it doesn't lay flat; I probably wasn't careful enough when sewing my seams. 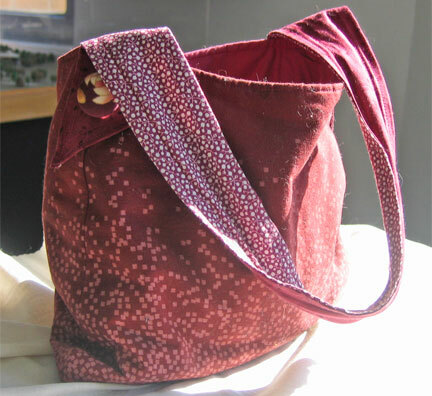 I should have sewed a slightly larger seam allowance for my lining, as someone suggested in the comments on my zipper pouches, to make it fit better inside the bag. 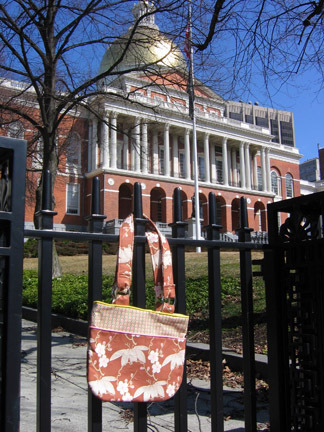 On the whole, though, I am so proud to be carrying a bag that I made myself! This was a great first bag to make. 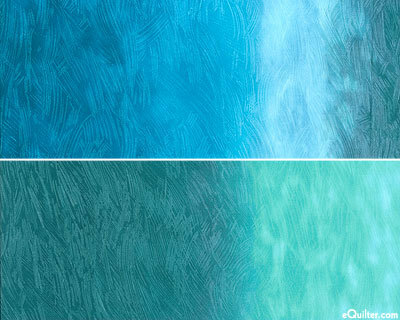 And it would be really easy to make variations in the size and shape, just by redrawing the pattern. Looking ahead, I want to try making some more structured bags, which will mean more exploration in the wonderful (and confusing) world of interfacing. I'll be posting a couple of helpful interfacing links soon, so stay tuned. PS Covered buttons are SO fun to make! Very satisfying little "pop" when they snap together. 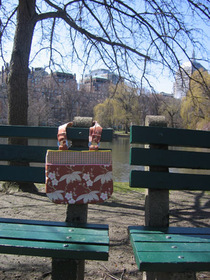 I was so pleased with my new walking foot that I couldn't wait to quilt something. So I got out a piece of applique that I made last summer to practice the hand-applique technique from Denyse Schmidt Quilts. 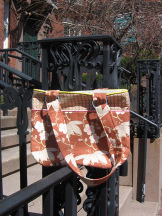 It's made from one of the bundles of scrap fabric that you can buy at Purl Soho. Hmm, seems to be missing something... I tried making a binding with my new bias tape maker, but it was way too narrow to go around something this thick. 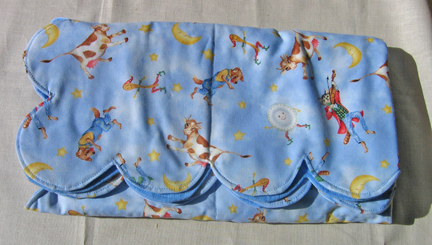 Not to mention, it didn't come out anywhere near as nice and even as my sewing books had led me to believe. I also burned my fingers with steam from my iron, trying to hold the edges down while I pressed. Clearly that's going to take some more practice! 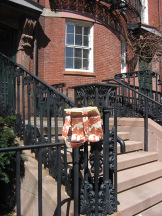 I also neglected to plan for the loop that would enable me to hang my potholder in the kitchen for all to admire. 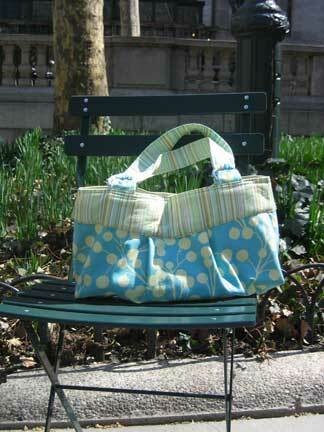 In case you haven't noticed, I am so the "Artistic Sewer" type, according to Bend-the-Rules Sewing. I am all about winging it! I did it! I successfully completed my scalloped baby blanket for my flickr group Simul-Sew last weekend, thanks to my new favorite thing: my walking foot! I had to order it from the Singer website, but thankfully it only took a few days to arrive. One of the hardest parts about this project was cutting the large pieces of fabric. For one thing, my cutting area is not large enough. For another thing, I soon realized that my fabric was warped - not soon enough though, because I'd already cut it into a trapezoid, instead of a rectangle. I pulled on it diagonally to straighten it out, dampened and repressed it. Then I had to unravel the threads from one of the edges so I could see the grain, recut that edge so I'd have one correctly cut side to measure from, did the same on the opposite side, folded the fabric so those edges met, and then trimmed off the two sides. I ended up with a rectangle that's somewhat smaller than planned, but oh well. Wish I'd thought of that and quilted between a different scallop. Not too bad, all things considered! I don't know as I'd make this project again because of the trouble with the scallops - the wrist pain as well as the puckering frustration. But it did allow me to practice sewing curves, and also get my feet wet with quilting without the intimidating piecing aspect. 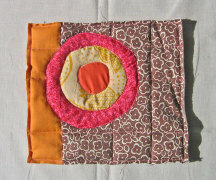 I really enjoyed it, now I want to make more quilts! 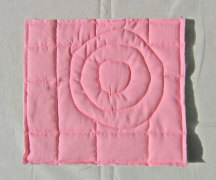 In fact, I quilted a potholder that same day, which I will post shortly. Simul-Sew on my Flickr Group! 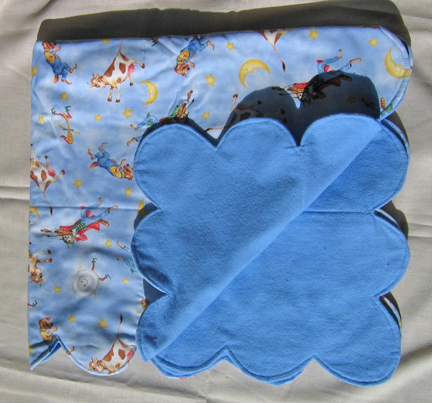 After we finish our baby blankets, the group is planning a Simul-Sew of the Stuffed Turtle from Bend-the-Rules Sewing. Everyone is welcome to join us! The Mega Zipper Post! 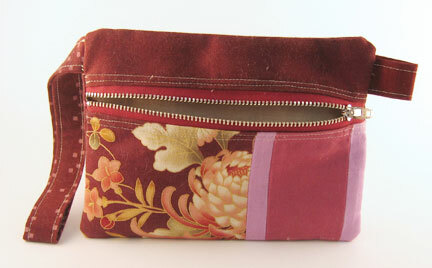 In which I make zipper pouches 3 different ways. 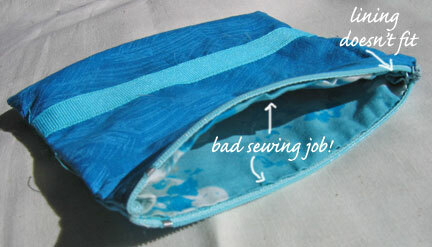 I ran into a little bit of trouble last week making the zipper pouch from Bend-the-Rules Sewing. Well, not so much trouble as not understanding the instructions. When I posted a question on the Bend-the-Rules Sewing Flickr Group, someone sent me a link to a different method for putting in zippers. Hmmm... Then I did some poking around, and I found yet another method. So I decided that I would try them all, so that you don't have to. 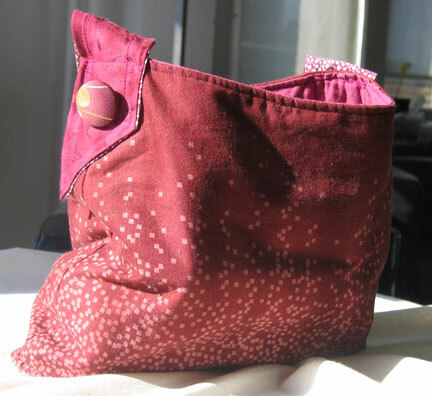 With this method, you make the outside of the pouch (with the zipper) and the lining as though they are separate bags, and then handsew the lining into the bag. 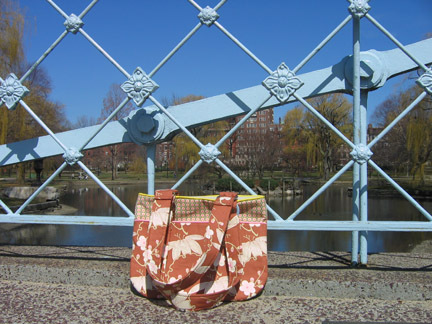 I was a little confused about whether to shorten the zipper before I sewed it into the fabric, but that was easy to figure out - and Amy Karol confirmed on the flickr group - shorten first, then sew. "Hi again! OK, I'm trying to follow the instructions for the zip pouch, but I'm confused... 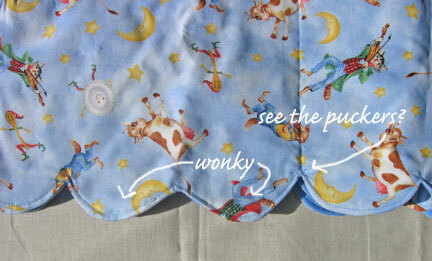 When I get to step 6, I start with the outer pouch turned inside-out and the lining right-side-out. 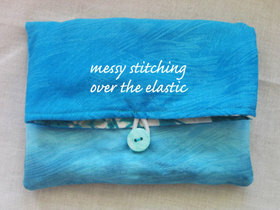 Then it says to insert the lining into the zip pouch and sew it together. But then how would I turn it around so it's all the right way again? 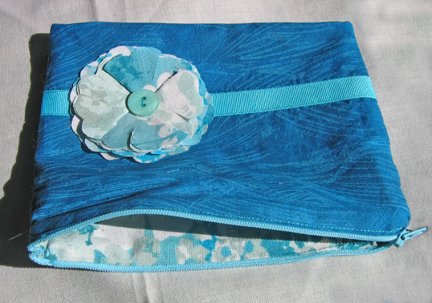 It seems to me that it should be the other way around - the zip pouch should go inside the lining, wrong sides together - so that when I turn it inside-out again, it will have the outer fabric on the outside where it's supposed to be. Am I crazy?" Some kind person responded and assured me that it would make sense when I tried it, and to remember to leave an opening for turning. It still didn't make sense in my mind, but I figured I should give the clearly more experienced person the benefit of the doubt - though not so much as to actually do all the work of handsewing. Instead, I pinned the lining (right-side-out) into the bag (inside-out) to simulate sewing, and turned it through one the gaps between the pins, to see how it would work. And... it doesn't. Success! 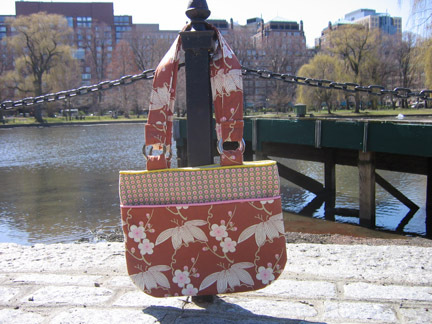 My handsewing looks good and my bag is flat. (I used the How to Finish Stuffed Animals tutorial from Wendi Gratz for my handsewing - so useful - best tutorial ever.) 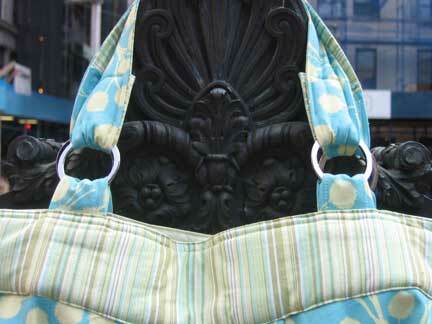 Only one problem - the zipper wouldn't close - the lining fabric is too close to the zipper teeth. Aargh. OK, maybe that sounds a little unnecessarily harsh. This is actually a great tutorial for this method (it starts about 3 minutes into the video, if you don't want to watch the whole thing), which is how you make zippers in skirts and other clothing. 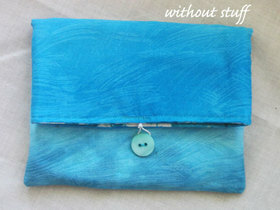 But it's a lot of work for a zipper pouch, though a necessary skill that clearly requires some practice! The basic technique is to baste a seam into your fabric, press it open, then baste the zipper to that, flip it over (so now the zipper is hidden underneath the seamline), and sew over the fabric. 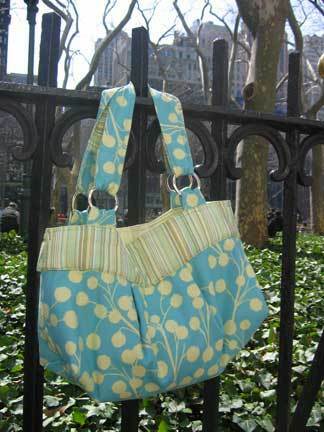 That way, from the outside, the fabric totally hides the zipper. Nice! My biggest mistake, I think, was in not basting the zipper down. 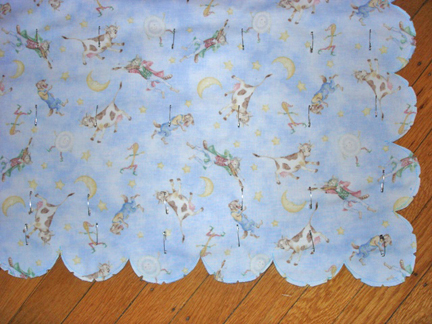 In the video, they use "basting glue," which I didn't have, and I didn't want to use regular glue on my fabric. So by the time I had sewn down one side, the zipper had shifted so it wasn't centered on the seam anymore. Ugh. If anyone has any advice about this, please let me know, because none of the instructions I've seen address this issue. Maybe other machines don't have this problem. 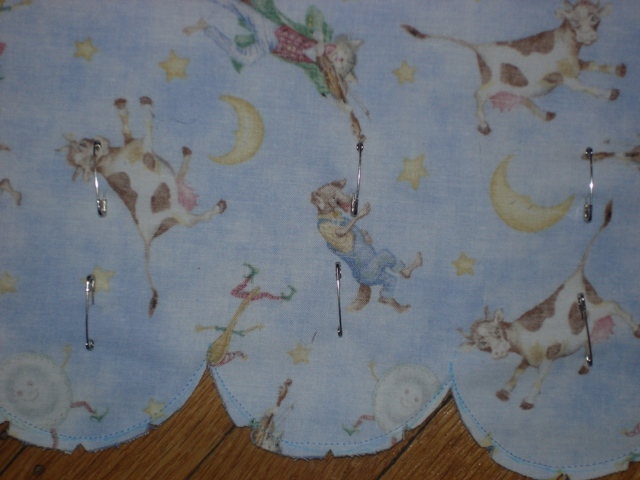 But I would like to make skirts, maybe soon, and I will need to be able to sew zippers into them. And now... Part II of my weekend of sewing! 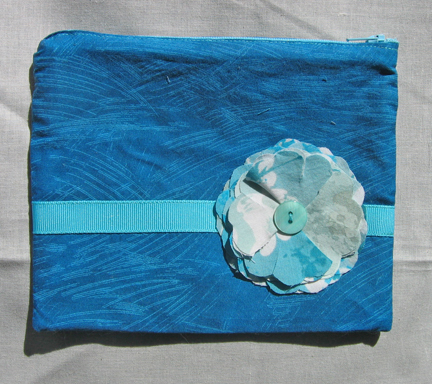 Having made my Artsy Clutches, naturally I needed a wallet to go with them - a nice little birthday set for Mom. 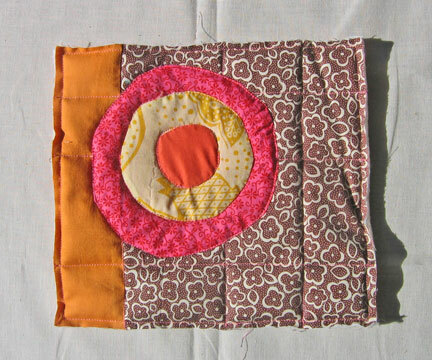 I started off by checking Amy Karol's Bend-the-Rules Sewing flickr group, which I strongly recommend doing before attempting any of the projects from her book (especially if your book is from the first printing, like mine is, which apparently contains some typos). This wallet is meant for credit cards, but a lot of people on the board have found that it's too narrow and the cards don't fit. So I took the precaution of enlarging the pattern to 140% instead of 136%, and I added a bit to the width too (just guesstimating when I copied the pattern onto the fabric). Then I kept checking throughout the process to make sure my cards were still fitting. The other fun thing about this project was handsewing the snaps. (Big surprise, I sewed the first one on upside-down. At least I got some extra practice burying the tails of my thread!) I think they are so sweet. 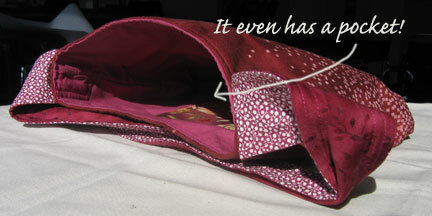 I sewed through each opening four times and then slid the needle and thread under the fabric to the next opening. Hopefully that will hold them. This past weekend, for the first time in a long time, I finally had the whole weekend to myself - no volunteering, no parties, no plans. Blessed freedom! And what better way to spend my time than by sewing birthday presents for my Mom, who gave me my sewing machine in the first place, and my aunt, who made me the world's most beautiful quilt? Plus, with two whole days to devote to this project, I wanted to move on to something a bit more complicated than napkins. 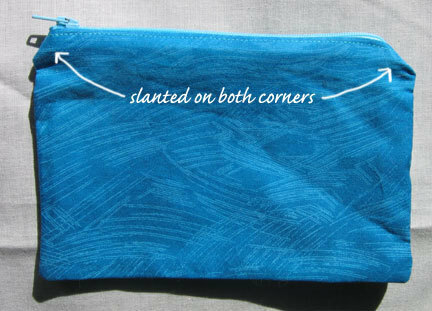 I wanted to try the Artsy Clutch from Amy Karol's Bend-the-Rules Sewing. 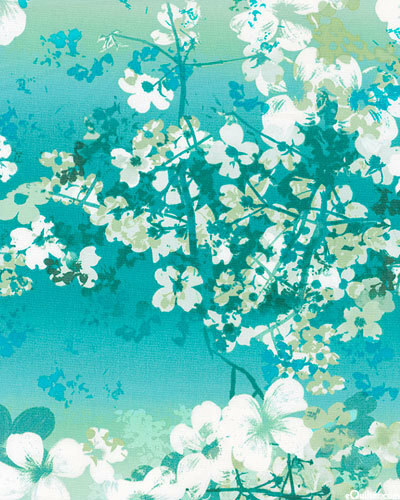 Both are from the 'Glacier Lights' collection by McKenna Ryan for Hoffman Fabrics. 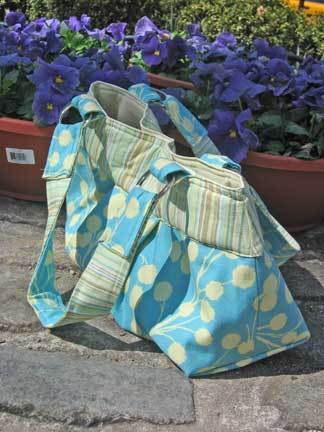 When it came time to sewing the lining into the bag, I had butterflies in my stomach! Sometimes I have a hard time translating a two-dimensional picture into the three-dimensional world, so I wasn't sure I'd assembled everything right until I turned the bag right-side-out. But it worked! 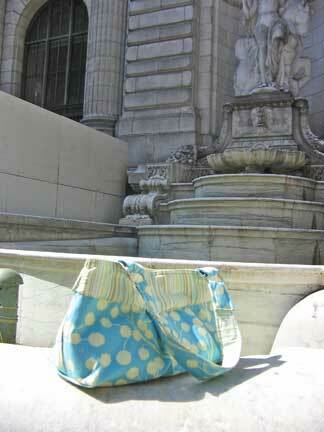 Even the elastic was in the right place - I managed not to sew it inside the bag. However, that same elastic did give me considerable problems in the next step, topstitching around the top edge. I used an elastic with a thick cord in the middle, and I think that combined with all the layers of fabric and flannel lining - double layers, because I was sewing along the hem - it was too much for my poor sewing machine. Ka-chunk! The needle hit that cord and stuck there, making a big tangle. Oh, to have come so far and then mess up at the end! I cut the tangled threads off and tried again, walking the needle over the cord by hand with the wheel. It made it past the cord that time, but messily. Oh well. Muuuuuch less bulky around the seams, so it lays nice and flat. Also, the corners turn out better when they're clipped first. My one major mistake was that, in using a much thinner elastic, I worried that it would be hard to secure, because the stitches would go over instead of through it, so I backstitched over it. Of course as soon as I folded it I realized how foolish that was: Now the messy backstitching is right on the front, the most visible place. Also, this elastic is too thin; it looks flimsy. I've bought a medium-sized one since then, to use next time. And I remembered this time to create a button shank so the button won't pop off. Stay tuned for Part 2 of my weekend of sewing... The No-Cash Wallet! 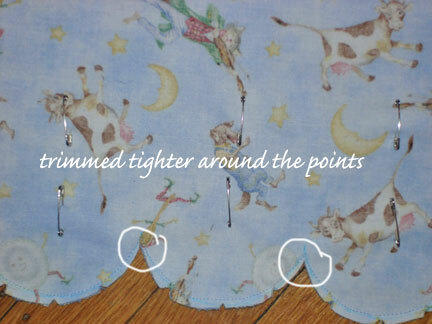 Always clip corners and trim and press seams. Backstitch where it won't be super obvious. Don't forget to create a button shank. 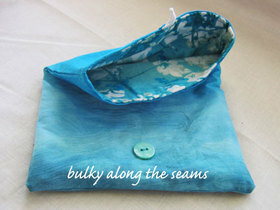 Need to work on pressing my seams correctly - might help to press them before I trim them? Otherwise I burn my fingers trying to press tiny seams. Try pressing seams in opposite directions, instead of pressing them open. 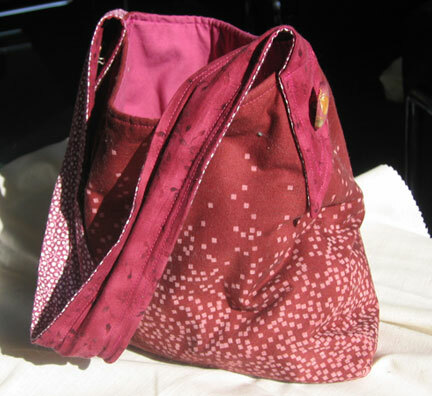 I.e., when the lining is placed inside the bag, the seam on the outer fabric would fold to the right and the seam on the inner fabric would fold to the left, so they "nest." 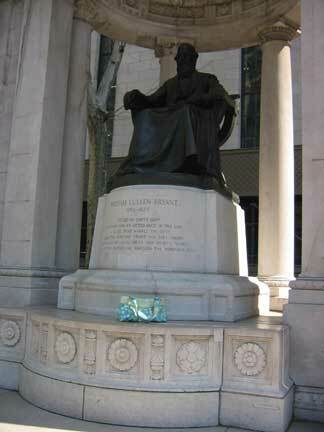 There's a photo of what I mean here (scroll down). 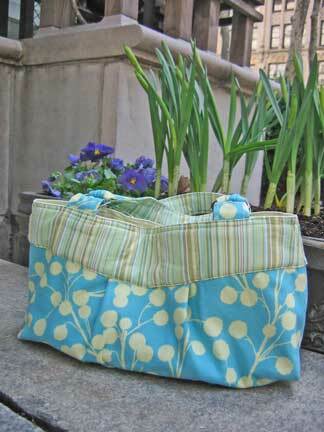 Try sewing with a walking foot to prevent layers from shifting.